Devigarh palace is a stunning palace nestled in the middle of Aravalli hills. Now it has been remodeled into a heritage hotel depicting the grandeur of the past. 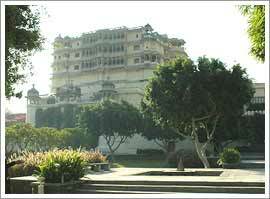 It is located in Delwara village of Udaipur, Rajasthan. The fabulous blend of the Medieval Rajput and European styles of architecture will leave you enchanted. It was constructed in the 18th century. Keeping the interest of travelers in mind, the heritage hotel was rebuilt and renovated by using marble and sandstone in an impressive style. Semi-precious stones have also been used to recreate its old world charm. Here hospitality is served in abundance and all the guests are treated like a royal guest of the King. The heritage hotel has 23 rooms aided with finest of modern room facilities such as AC, TV with satellite channels, showers, running hot and cold water, attached bathroom, telephone with international dialing and much more. Each room has a mini bar catering to your drinking needs. The stay at the most premium suite called the Devigarh suite transports you into the lap of luxury. It is aided with a mesmerizing crystal water swimming pool and a personal Jacuzzi (steam bath).The hotel also organizes exciting stay in the tents on request. They are seven in number and set in the premises of the hotel from October to March. Dine at the Devigarh restaurant where you will be served amazing delicacies which will make your mouth water. Rajasthani, Thai and Continental cuisines are offered; relish whatever attracts your taste buds. Enjoy drinks with your family and friends at the well stocked bar at the hotel. Pamper yourself with recreational activities such as swimming, yoga, beauty parlor outdoor games and jacuzzi. Great conference and banquet facilities are offered by Devigarh Palace hotel to hold meetings and functions.